Babblings of a Mommy: Dior Scented Nail Polish. 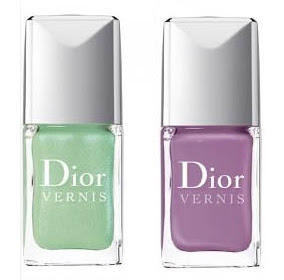 For their Spring 2012 beauty collection Dior has released a Garden Party set containing two limited-edition polishes, Forget Me Not (lilac) and Waterlily (pale green). Aren't they pretty? But these pretty pastels don't just look good--they smell good too! When dry they release an "intoxicating rose fragrance." I know that scented nail polishes existed, but I've never been one to try it. I must admit that these lacquers have definitely sparked my curiosity though! Would you try them? The Dior Garden Party nail polishes are available now for $23 each. Gorgeous colors! Really curious to see Waterlily in person.